Alana and I booked a 7am flight from Auckland to Nelson in order to reach Bark Bay by the end of the day. 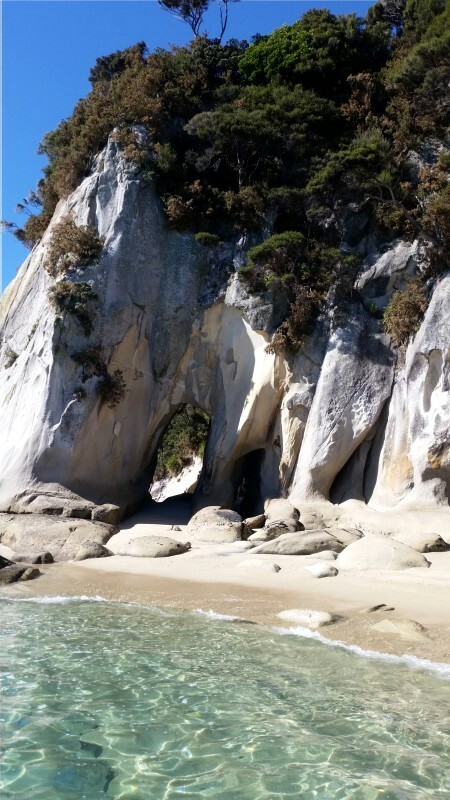 Bark Bay is located within the Abel Tasman National Park, accessible only by foot or boat. Everything had to line up perfectly so that we could pick up our rental car, catch the 11:15am water taxi, and hike 3-5 hours before dark. A delayed flight would wreak havoc on our plans. Thankfully, things went like clockwork and we even had time for a quick drink while waiting for the Marahau Water Taxi. 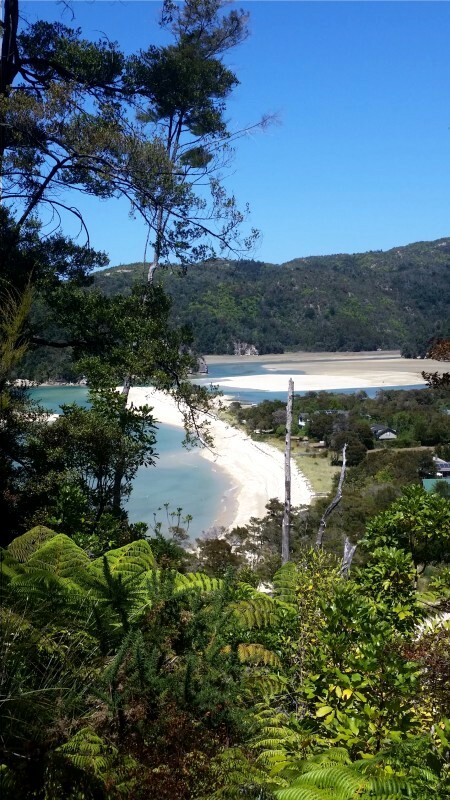 Ginger beer for me – I was already queasy from the windy roads getting to Abel Tasman National Park and was not looking forward to the boat ride. 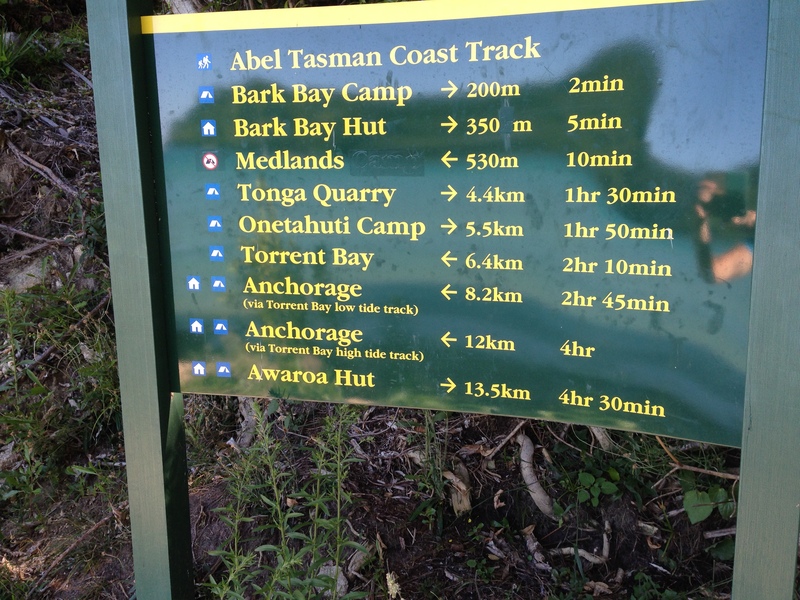 After 40 minutes on the water we were dropped at Anchorage Bay, our starting point for the Great Walk. Thankfully it was low tide allowing us to avoid a 1-hour bypass that would take us inland. We passed more people than I saw on my previous Great Walks, but by no means was the trail crowded. After an hour of walking along the beach we stopped for lunch. Then there was a steep incline and an undulating path for the rest of the day. At several points there were opportunities to exit the main trail and climb down to the beach. It was worth the treacherous climb to cool off in the idyllic setting! We reached Bark Bay before sunset and enjoyed relaxing at the hut and laying on the beach. Congratulations to Alana! She was tackling her first overnight hike like a champ. The weight can be a real challenge when you are not used to carrying all your food, clothes, and sleeping gear on your back. The next morning we were on the trail again by 8am and reached our destination, Onatahuti Bay, early. We caught an earlier taxi back to Marahau and began our trip to Blenheim. Exhausted from the hike we got to the bus stop and relaxed until its late arrival. 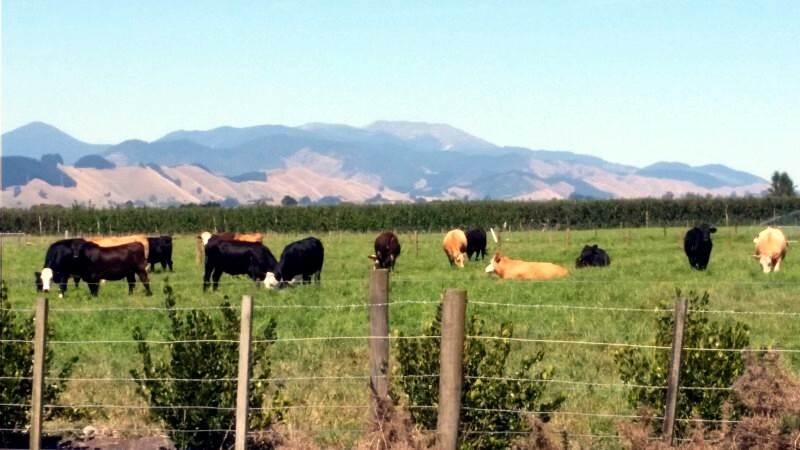 The bus driver on the 2-hour ride to Blenheim provided bits of local information as we passed through different regions. 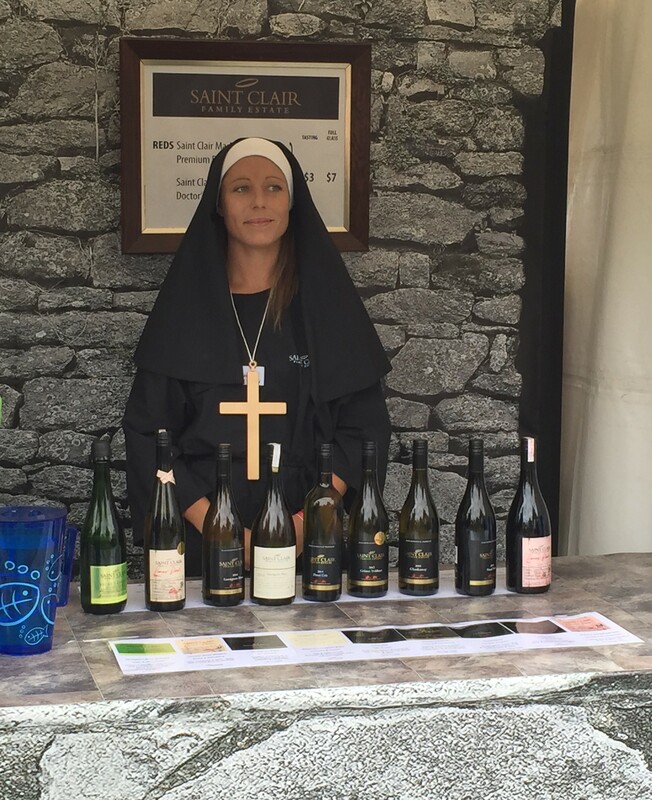 The highlight of our time in Blenheim was the Marlborough Food and Wine Festival on Valentine’s Day. Unlike Toast Martinborough, this event was held at a single location, Brancott Vineyard. Hundreds of tents were set up to house local food, drink, and music. Many of the tents had creative ways of attracting festival goers including photo booths, a kissing booth, and offering to do my hair & makeup! The weather was gorgeous so after wine tasting we were happy to chill out on the grass and enjoy the live music. Random note: other festivals have provided lanyards that hold your wine glass around your neck to free up your hands. Marlborough Wine and Food Festival did not provide these, so bring your own.